The extensive range of home décor products available at @Home furnishings can sometimes be extremely ornate or intricate in design. 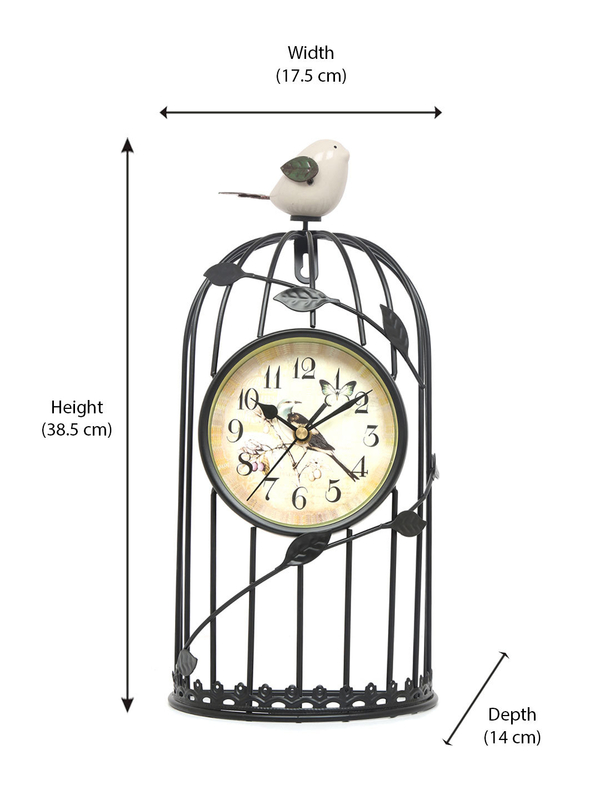 The Free Bird Cage Table Clock is an example of such a product. The product has a height of 38.5 cm with a length and width of 17.5 cm and 14 cm respectively. It is shaped like a bifurcated bird cage, and the clock is framed by the cage. A strand of leaves runs across and there is a white bird sitting atop the cage, at the very top of the product. This is an inspiring message crafted into the design of the product itself. The black coloured cage is actually made out of plastic, that guarantees the longevity and durability of the product. Looking for a designer clock to accentuate your living room? The Free Bird Cage Table Clock fits the bill. You can place it on the table in your living room to really convey the message incorporated in the design. However, there are provisions to hang it up on the wall as well. You can also put the clock in your bedroom, to remind yourself to be a free bird when you wake up every morning. Enjoy these benefits first hand by making your purchase of the Free Bird Cage Table Clock from the @Home furnishings website today.